Injen has finally released the long awaited SP6080 SP series air intake system for the 2004-2011 Mazda RX8 1.3 Rotary (Part# SP6080) After months of extensive R&D we are confident to say that the Injen Air Intake System for the 2004-2008 Mazda RX8 1.3 Rotary is by and far the best system available for the Mazda RX-8, offering the largest power gains and also a truly unique setup that looks simply amazing under the hood. 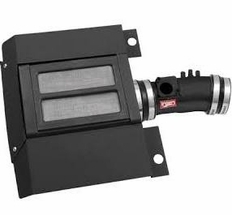 The Injen Air Intake System for the 2004-2011 Mazda RX8 1.3 Rotary also features Patented Air Fusion technology, which stabilizes both short and long air fuel ratios. This is how Injen was able to produce over 21hp at the wheels on the Mazda RX8, better than all of the competition! You purchased one of the coolest combinations of sport and luxury on the road, so why would you settle for anything less than the best modifications? The 2004-2011 Mazda RX8 1.3 Rotary Injen Air Intake System by Injen will definately satisfy your needs, with gains of 22hp and 13tq! What Makes Injen Intakes better than their competition?Not only are all Injen Technology Intakes made in the USA, Injen cool air intake systems feature MR Technology, developed by Injen to maintain safe air/fuel ratio and highly efficient tuning. Injen also does extensive dyno tuning and r&d before releasing an intake, unlike many other companies who take an "if it fits, use it" attitude to aftermarket intakes. New Level Motorsports is an Injen Direct Authorized dealer. The part number for this item is SP6080WB and it fits 2004-2011 Mazda RX8 1.3 Rotary models.